Is the answer black and white? Learning basic French vocabulary includes learning oui and non, but there are many more French translations for 'yes' and 'no'. Learning some additional ways to respond will take your vocabulary of basic French words and expand it to a higher level. Need a more nuanced way, or a more emphatic way to say 'no'? Try out the many other ways that the French have to say non. This is a highly emphatic way of saying 'no'. For example, if someone makes a statement that you consider to be absolutely untrue, or that you know to be untrue, you might respond by saying mais non!, which, literally translated means 'but no'. It's pronounced 'may no' (the 'no' is nasal) and is highly emphatic that the speaker disagrees. This is also a highly emphatic phrase, but is more often used in a situation where a request is involved. For example, if someone asks you to do something, you might respond with this phrase; be aware that it's a very strong phrase, meaning 'absolutely not!'. It's pronounced 'ab-sa-loo-men pah'. This phrase is used to change the direction of a conversation. If someone makes a statement, for example, that makes an assumption about why you were late this morning, but it's untrue, then you might say c'est pas ça, c'est que… and offer the real reason. The written correct form is ce n'est pas ça, but in oral speech, the ne disappears. It's pronounced 'say pah sah'. This phrase can be used in a situation similar to the phrase above, but with a slightly different context. For example, if someone makes an assumption about why you were late this morning which is not completely true, but which is partially true, you could answer with this phrase. It means 'not exactly'. A more common context in which to use this phrase would be if someone were trying to explain something back to you and you knew that their explanation was close, but not exact. It's pronounced 'pah toot ah fay'. If you find yourself saying oui all the time and leaving it at that, it's time to learn some new ways to agree! This is a nicely emphatic French phrase which means 'yes' in a very strong way. A situation for its use would be if someone asks you 'you're not going to drive through the night, are you?' and you respond ben oui!, pronounced 'beh wee'. Note that the proper spelling is bien oui, but it is never pronounced that way. This phrase also means a very strong 'yes', but used in a slightly different context. For example, if someone asks you a (positive) question and you have a very emphatic response: 'Are we going to the beach?' -mais oui!. Pronounced 'may wee', it means that of course you're going to the beach. This is a non-emphatic way to say 'yes'. For example, if someone points something out to you, which is not a groundbreaking piece of information, but you agree that it's true, and is relevant, you might respond with this phrase, pronounced 'ey wee'. The opposite of pas tout à fait, this phrase means 'exactly' and is often preceded by oui. This phrase means 'it's possible' or 'that's possible'. It could be used in a situation where somebody makes a suggestion as to why something is the case, and you respond that that is indeed a possibility. Pronunciation guide: 'sah suh peu'. 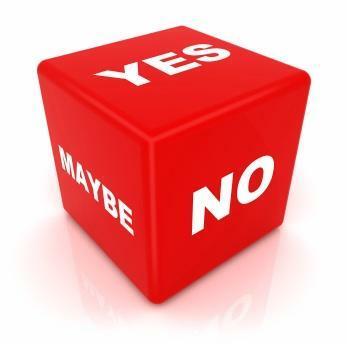 Several ways to show that you can't decide between 'yes' and 'no' also exist. In addition, there are phrases which can precede a positive, or a negative answer. Properly spelled bien, this phrase marks neither agreement nor disagreement, you are on the fence and there are reasons in your head to agree, as well as reasons to disagree. It's pronounced 'beh'. This is an interesting phrase, which means 'it seems to me that…'. If you add 'oui' or 'non' onto the end of it, you get either 'I think so, yes' or 'I think not'. Pronunciation is difficult: 'eel meu sam bluh kuh'. This is a nice way to express that you hope either positively or negatively for something. If someone asks you if you'll be there on time, you might say 'I hope so, yes': j'espère que oui; adding non in the place of oui gives the opposite meaning. It's another somewhat difficult phrase to pronounce: 'jeh-spare kuh'. The positive version of this phrase means 'I agree', and the negative phrase means 'I disagree', and is used in contexts where an opinion should be given. This phrase in its totality is either je suis d'accord or je ne suis pas d'accord, but is shortened in several ways in speech. The negative version leaves out the ne; in addition, the je suis can often be shortened into something that sounds like 'shoe', leaving one with 'shoe' (pas) d'accord, which is pronounced 'shoe (pah) dah cor'. Any of these are great French translations for yes and no. With all these nuanced ways to say 'yes' and 'no', your conversational skills will be much improved!